Today at the New York Times International Luxury Conference in Versailles, France – coincidentally the seat of French royal power between 1682 and 1789, and perhaps less coincidentally the birthplace of the French Revolution – HP Inc. unveiled a line of new laptops, including a new line the company calls the world’s thinnest notebooks, and two 18K gold-plated, diamond-encrusted limited edition devices that will be auctioned at next month’s Cannes Film Festival for charity. In a statement, the company said its updated Envy laptops and new HP Spectre line (pictured above) set a new bar for premium PC users, while its limited edition notebooks, designed by Dutch-born, London-based Tord Boontje and Los Angeles-based jewellery designer Jess Hannah, would “encapsulate luxury” for their lucky owners. The new 4.4 lbs., 17.95 mm thick, 15.6-inch screen Envy laptop and 6.6 lbs., 25.45 mm thick. 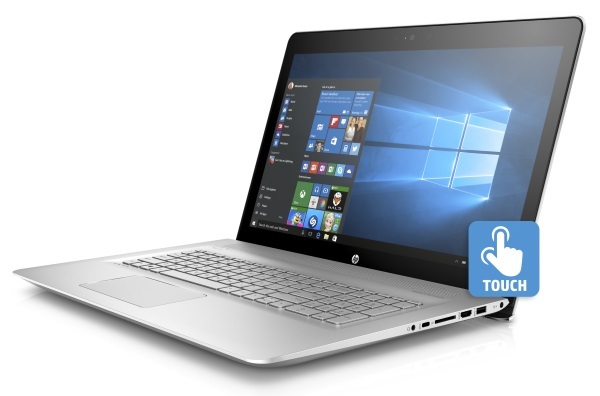 17.3-inch screen (below) Envy laptop are both lighter than their predecessors and can charge 90 per cent of their batteries in 90 minutes when powered off, HP said. The 17.3-inch version will include an Intel Core i7 processor with Nvidia GeForce 940MX graphics, while users of the 15.6-inch version will be allowed to choose a lesser processor, with UMA or Intel Iris graphics available. Both devices also include 16 GB of core memory, up to 1 TB of additional memory, and an optional camera with support for Microsoft’s biometric security system, Windows Hello. The 17.3-inch version also includes an optical disc drive. Meanwhile the 4.5 lb.s, 18.8 mm thick Envy x360 hybrid (below) features a 15.6-inch screen, up to 11 hours of battery life, and sixth generation Intel Core i5 or i7 processors, with optional Intel Iris graphics or a 7th generation AMD FX 9800P quad-core processor available. Other components include two USB 3.0 ports, HDMI and SD card readers, and up to 16 GB of system memory, plus single or dual storage options that accommodate up to 2 TB of additional memory. HP’s new Spectre, which is only 10.4 mm thick, weighs just 2.45 lbs., and features a 13.3-inch screen, is powered by a two-piece hybrid battery that the company says can provide up to nine and half hours of use. Under the hood, it uses sixth-generation Intel Core i5 and i7 processors, and includes PCI-e SSD with up to 512 GB of storage. But really, the Spectre models HP is clearly hoping will make the biggest splash are the luxury limited editions by Boontje and Hannah, with the former’s design (below) incorporating cherry blossoms, a peacock, and a butterfly into its floral pattern, which is accented with 18K gold and Swarovski crystals. 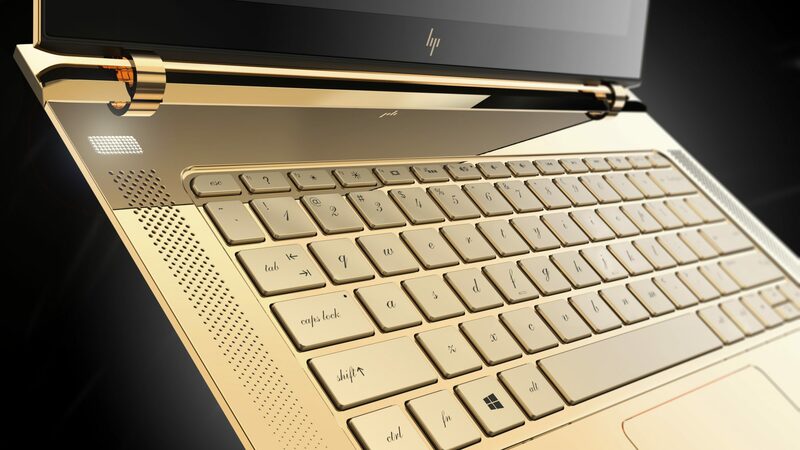 Hannah’s, meanwhile, features a fully 18K gold-plated cover and keyboard alongside a diamond-encrusted logo. 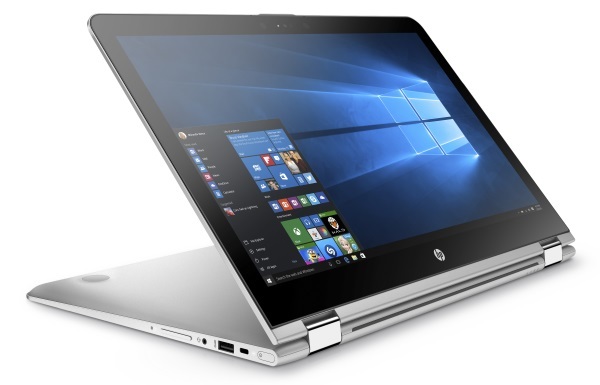 In terms of availability, the 13.3-inch screen HP Spectre will be available for pre-order on HP.com and BBY.com on April 25, and at Best Buy on May 22; the 15.6-inch HP Envy x360 will be available on HP.com on June 1 and at Best Buy on June 12; and the 15.6-inch and 17.3-inch HP Envy laptops will be available on HP.com on May 25 and retailers on June 12. Canadian prices have not yet released.